Gucci ballet flat in lambskin leather. Round toe with grosgrain bow and embroidered bee. For in-store inquiries, use sku #2075094. Gucci kid leather ballerina flat with grosgrain green/red/green Web bow. 0.3" flat stacked heel. Round capped toe. Slip-on style. Rosebud leather lining. Smooth outsole. Made in Italy. Fit: Runs true to size. 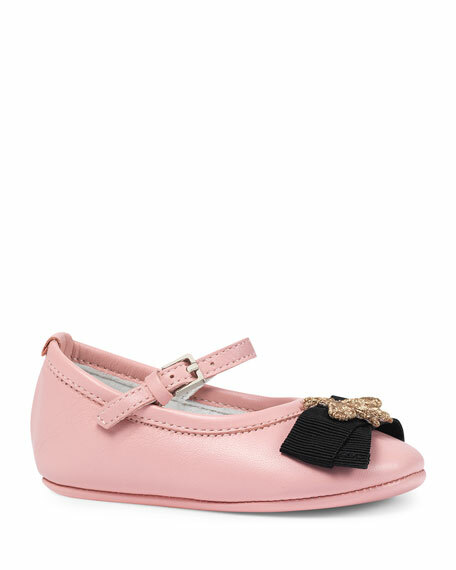 Gucci ballet flat in lambskin leather. Round toe with grosgrain blue/red/blue web bow. Strap with grip strap closure. Rubber sole. Gucci ballet flat in lambskin leather. Round toe with grosgrain blue/red/blue web bow. Strap with grip strap closure. Rubber sole. Made in Italy.